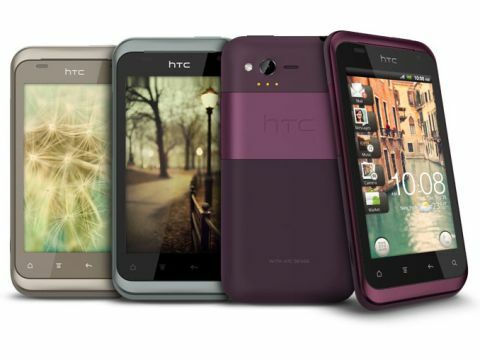 Another stylish mid-range offering from HTC…but is it offering anything particularly new? The HTC Rhyme is a stylish version of a phone that's already great in its own right but doesn't bring anything new to the table except a few fancy accessories. From stick-on Swarovski bling to mobile phones shaped like make-up compacts (ick) to laptops with 'accessorisable covers to match your outfit!' (seriously?) tech companies have always had a hard time marketing at women without making their product look and feel entirely dumb. The HTC Rhyme may not be explicitly aimed at women (though all the mentions of purses and bags in the blurb might be a giveaway), but there's something about this tactile handset that's going to appeal to the ladies out there. The colour, for a start. It's not pink. Fancy that! Instead, the handset is a deep, delicious plum colour, instantly giving this mid-range HTC a little something different to the blocks of black that dominate the market and, perhaps, not entirely alienating men from their target market either with their second bronzey-silvery colour that's available. It also comes with some sweet accessories: a dock that, once the phone is cradled in it, automatically displays the time, calendar, gallery and music; Dre Beats-style headphones and a nifty little charm that lights up when a message or call is being received. As for the design of the phone itself, the part-rubberised, part-brushed-metal casing is smooth, also allowing for a decent amount of grip with one hand and minimising the fear of dropping it when trying to text/tweet/call on the go. The 3.7-inch capacitive touchscreen houses the home, menu, back and the dedicated search touchscreen keys plus a VGA cam. The soft lock key placement at the top of the chassis is a little annoying for small hands, meaning you have to shuffle the phone around a bit to unlock and then use it, but that's a minor point. On the back of the phone, above the metal HTC stripe sits the 5MP camera, LED flash, external speaker and three sensors for the accessory dock. The battery cover takes a bit of cajoling, but eventually slides right off. The volume rocker blends into the right side, the Micro USB is a covered dock sitting on the left side and the 3.5mm headphone jack sits on the top next to the power/lock button. The unibody design is definitely sleek. The HTC Rhyme weighs a good 130 grams and is 10.85mm thick…not the thinnest or lightest but by no means a brick either. In fact, it has a good weight and feel in the hand that reassures you of its solid build. Once on, the HTC Sense 3.5 overlay delights; it's quick, it's intuitive, it's pretty customisable and it looks great on the 480 x 800 resolution screen. Running on Gingerbread and a single core 1GHz processor, this HTC doesn't keep up with the hardware packed into the likes of the HTC Sensation or the HTC Evo 3D, but it does a decent amount for a mid-range phone and of course, looks great.